Black Veil Brides is an rock band that formed in Cincinnati, Ohio in 2006. They won a Billboard award in 2010 for their album, We Stitch These Wounds. They made number #1 on the top independent artists in 2010. 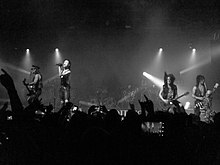 The lead singer, Andy Biersack, created the band. This page was last changed on 22 February 2019, at 11:06.